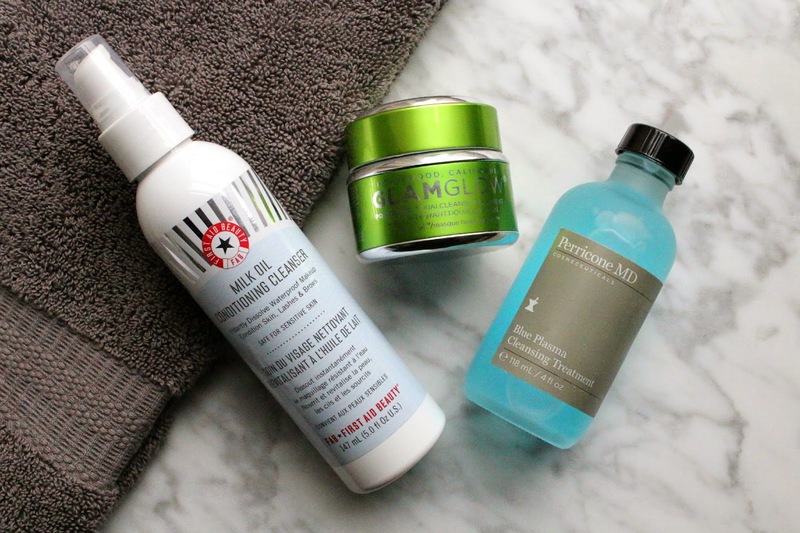 I'm sure by now if you are a regular blog reader, you know my affinity for cleansers. They are so easy to interchange in and out of a skincare routine and results are quicker than serums or moisturizers. I've recently been testing out three new cleansers that vary from the average cleanser out there in either formulation or technology. All are from brands that I love and respect (and use frequently), so I knew my skin was in good hands. 1. First Aid Beauty Milk Oil Conditioning Cleanser - The name completely confused me when I first saw this bottle. Was it an oil? Was it a milk? How could it be both? Well as you can see from the left swatch in the below photo, it's a thick milk texture. The oil in the name refers many of the ingredients that are derived from different oils, but the overall feeling of the cleanser is a delightfully thick milk. It is designed to be used without water, and in a pinch can remove makeup and cleanse the skin by just massaging it on and wiping away with a tissue. I prefer to use it with water, but the results are still the same. This stuff cuts through some serious makeup - fast and easy. It feels so nourishing on the skin and while I normally follow my initial cleanse with a second cleanse (by a different cleanser), this was so effective I could use it alone and my skin felt amazing. Another hit from First Aid Beauty. 2. 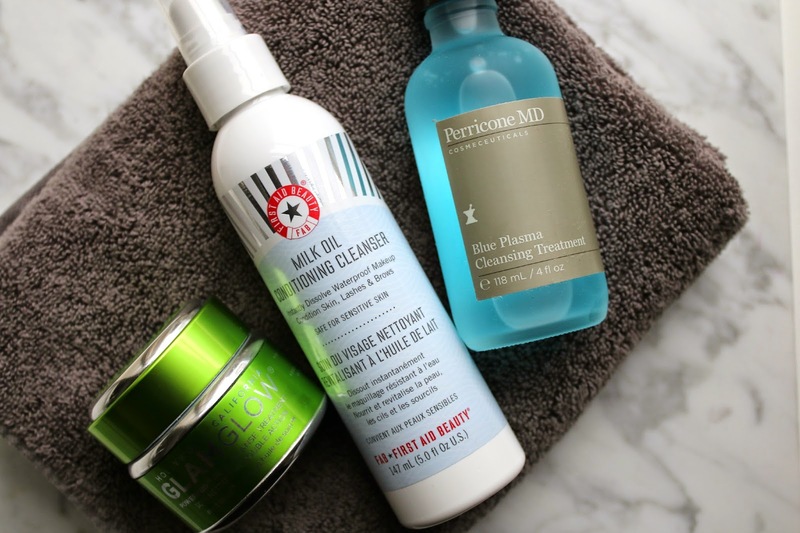 Perricone MD Blue Plasma Cleansing Treatment - While I may have been a bit confused by the FAB Milk Oil Cleanser, I was totally at a loss on how to use this new Perricone MD Blue Plasma Cleansing Treatment. It says it can be used as a cleansing water to remove makeup and cleanse the skin, but we all know I wear a full face and this just wasn't powerful enough to do that. However, that being said, I shortly after fell into my groove with this as a second cleanse and now can't get enough of it. I find it best used on a cotton pad and swiped over the entire face which leaves my skin feeling so fresh and clean, yet still conditioned and hydrated. Because of the Blue Plasma technology, it helps to purify pores by removing impurities which is the first thing I noticed. I have been suffering from an awful hormonal breakout this past month, and only after a few weeks into the breakout did I decide to try this cleanser and soon began to notice that is why my skin began to take a turn for the better. It wasn't overnight, but there was a marked difference when I added in this cleansing treatment. The congestion I was suffering from on parts of my face was beginning to subside and now I am in the homestretch and my skin is slowly getting back to normal. Just as I felt the original Blue Plasma was a winner, this new Cleansing Treatment is definitely award worthy. 3. 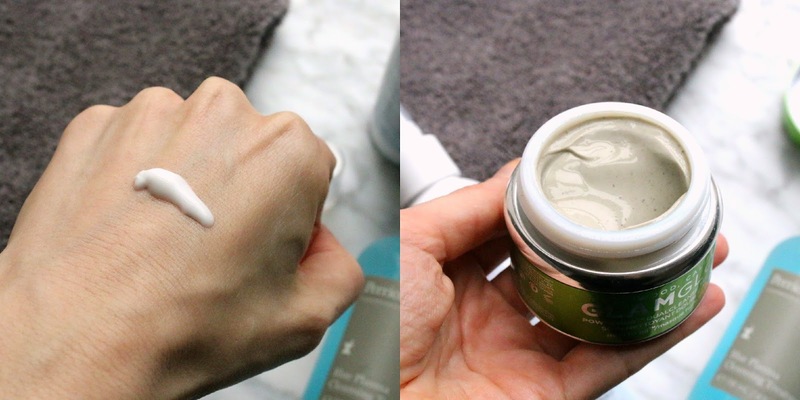 GLAMGLOW Powermud Dualcleanse Treatment - Though not technically a standard cleanser, this new mud-to-oil treatment definitely straddles the mask/cleanser category and deserves some recognition. While I don't use this to remove my makeup, I L-O-V-E this as a second cleanser step because it helps me knock out two birds with one stone - cleanse and mask. I apply this after my first cleanse, leave it on for 5-10 minutes and then remove. While it sounds basic and simple, it's so not. The mud dries down and then once water is added turns into a glorious oil that really gets my skin super clean and soft. Because it's such a deep cleaning treatment, I find it best used only once a week but that one time will leave your skin glowing. I have used other GLAMGLOW products and enjoyed them but this instantly stood out to me and became a favorite from the range. Oooh I love new FAB products, I'll definitely be trying this one. I have a sample of the Glamglow product and I never thought to use it as a second cleanse I will definitely be giving that a try! The FAB cleanser sounds absolutely amazing! I love both cleansing oils and creamy cleansers, and it really sounds like the best of both worlds. The Glamglow cleanser/mask sounds like a great multi tasker as well!